Russian Checkers (also known as "Shashki") is a Checkers variation that is popular in Russia and other countries that made up the former Soviet Union, as well as in Israel. 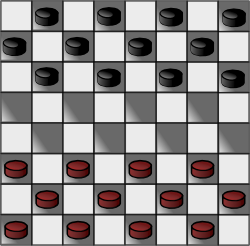 Russian Checkers is played on an 8x8 checker board with 12 pieces on each side (like Standard Checkers), and has rules similar to International Checkers, with a few exceptions. Like International Checkers, single men can capture opponents both forwards and back, and kings are "flying kings" that can move as far as they want along unblocked diagonals. If a single man reaches the opponent's king row in the middle of a sequence of captures, it is kinged, and then continues its movement. If a player has a choice between more than one capture sequence, they can choose which course to take, and are not obliged to choose the one that captures the most opponents. However, a player cannot stop in the "middle" of a capture sequence – it must be played out until no more captures are possible in that move. If there are 3 kings playing against one king, and the player with three kings is unable to win within 16 moves, then the game is a draw. Poddavki Checkers – This is a "giveaway" version of Russian Checkers, in which the object is to lose all your men (or be completely blocked) first (similar to Giveaway Checkers). Russian 10x8 Checkers – Same as Russian Checkers, except played on a 10x8 board.